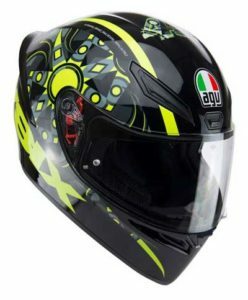 13 Looking to buy this AGV? Always fancied owning a range-topping track helmet like the AGV Pista GPR or the slightly cheaper Corsa R, but just can’t bring yourself to pay range-topping cash? 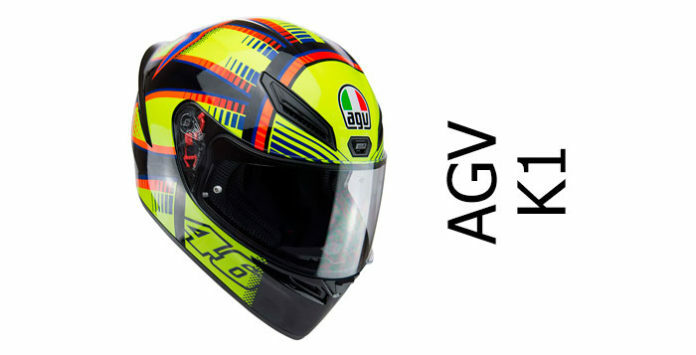 Then the great news is that AGV has launched the K1: a very much entry-level sportsbike helmet with most of the look and appeal of the Pista but for around a fifth of the price. And like the Pista and Corsa, it’s part of the same family, meaning it’ll also benefit from all the aero and wind-tunnel work that AGV has put into their race helmets, which should mean it’s stable and super aerodynamic. Both the Pista and the Corsa are SHARP five star rated helmets, meaning they’ll give maximum protection in an impact. But they’re made from advanced composites and carbon fibre to achieve that level of protection. 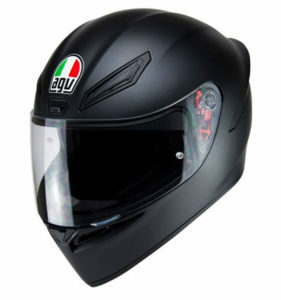 The K1 is made from cheaper materials – in this case thermoplastic – which is easier to form into a helmet shell and hence translates into a cheaper helmet. Which is not to say it’s necessarily going to perform worse because many thermoplastic lids appear in the SHARP 5 star rating list too because much of the protective qualities of a helmet is in the design of the helmet as well as the materials and construction methods used. Looking back at the data, recent thermoplastic AGVs like the AGV compact have scored 4 stars out of five and in fact, of the four thermoplastic AGVs that have been tested over the years, every single one has scored four stars for safety, which is a very impressive result indeed. Read our ‘more about crash helmet safety‘ guide for important information about how to choose a safe helmet. 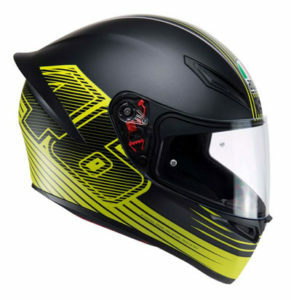 But with AGVs record of producing some really effective thermoplastic helmets, coupled with the fact that, at the time of writing, AGV are our third safest helmet brand, then it very much looks like you can trust a helmet with AGV on the front to give pretty amazing levels of protection. And we’ve no reason to expect those levels won’t continue with the AGV K1. Well, it’s got a wide/tall visor opening that’s necessary for a racing helmet – and that’s also great for all-round visibility on the road too. It’s produced in 2 helmet shell sizes (the more, the better in terms of looks, fitting and safety) along with four expanded polystyrene (EPS) liners to cater for the different helmet fitment sizes. And it has a Pinlock anti-fog ready visor to keep your vision clear – though you’ll have to shell out extra for the actual anti-fog insert as it doesn’t come in the box. There’s no word yet on how well the AGV K1 fairs in terms of noise suppression. On the one hand, it’s been carefully aerodynamically shaped to increase airflow and reduce resistance, and that should reduce helmet noise. But on the other hand, it’s a sportsbike helmet and they traditionally don’t fair well in terms of quietness (it’s simply not a priority and noise-suppressing materials increase weight). Of course, if you stick in decent ear plugs – like you should when you’re going any further than a trip down the local shops – then we expect the K1 should be quiet enough. The K1 has a double chin vent and a triple forehead vent; all closeable by sliders. 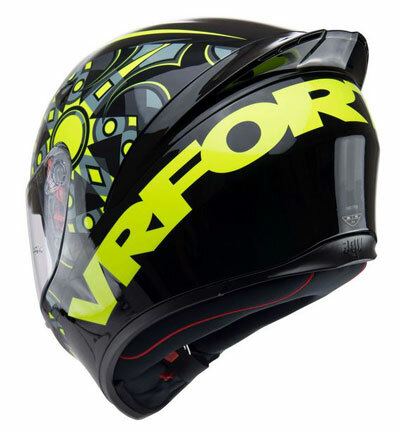 It all features AGVs Integrated Ventilation System or IVS which is their name for vents that pass air directly through the helmet shell and into channels around the lining. Moist and warm air then passes out of the helmet via the twin rear exhausts sited just below the rear spoiler. It’s all a reasonably standard configuration in helmets these days and since the Corsa R vents well and the PistaGPR is about average, we’d expect the K1 to perform somewhere between average to good. Another Rossi-inspired K1 – this one’s the Flavum. 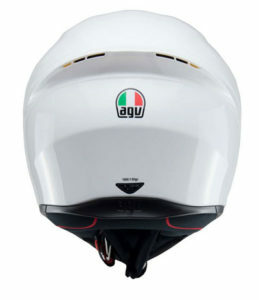 Like all AGVs sportsbike helmets, the helmet aperture on the AGV K1 is wide and tall to give decent peripheral vision as well as forward vision when your chin’s on the tank and your head’s in a sports bike tuck. It’s also got a quick release visor using AGV’s XQRS or Extra Quick Release System. That’s handy for swapping out visors or removing it to give it a quick clean. 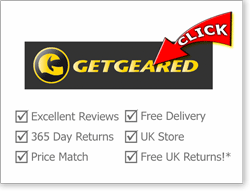 And AGVs quick release system is one of the best so you shouldn’t have a problem here. The visor does have Pinlock pins (good) but doesn’t come with the Pinlock insert in the box (not so good) so expect to pay £30ish extra for a Pinlock antifog if you live somewhere wet/cold where your visor is bound to mist up from time to time. Inside the K1, you’ll find a removable/washable comfort lining containing moisture absorbing Dri-Lex fabric. Dri-Lex makes for a comfortable lining that’s pretty wear resistant so should be a decent and durable interior. The K1 is available in fitment sizes XS-XXL. Valentino Rossi is still very much AGVs poster boy, so with the K1 being a sportsbike helmet, there’s three VR46 options available – Rossi’s trademark Soleluna as well as the Edge 46 and Flavum 46. Aside from these, there’s a gloss and matt black version and a gloss white. 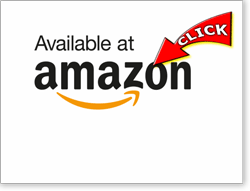 Expect more graphics to be released over the coming months/years though, so to see more and find the latest deals on the AGV K1, please click through to our recommended retailers using the links below. The AGV K1 comes with a double-d ring fastener – they’re nice and safe and preferred for track-helmets. The helmet weighs 1.52Kg (3.3lbs) which is obviously heavier than its Pista GPR (1.3Kg) and Corsa R (1.35Kg) brothers, but isn’t bad at all and about average for a full face thermoplastic helmet. And because it shares aerodynamic properties with its racing stablemates – including a rear spoiler designed to improve stability at higher speeds – we’d expect the aero on the K1 (slipperyness, stability and reduction in buffeting on a sportsbike) to be excellent. The AGV K1 comes with a 2 year warranty (add another year’s warranty if you register the helmet with AGV online). AGV’s been very cunning with the K1. 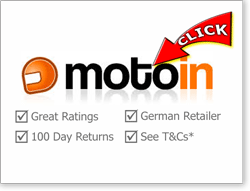 They’re capitalising on all the dev work that their MotoGP and racing teams have put into designing their race helmets and transferred it over into a much cheaper helmet package that’s bound to appeal to heaps of racing fans who’re running their bikes on a budget. And we’d expect the K1 to maintain AGVs excellent reputation for safety. 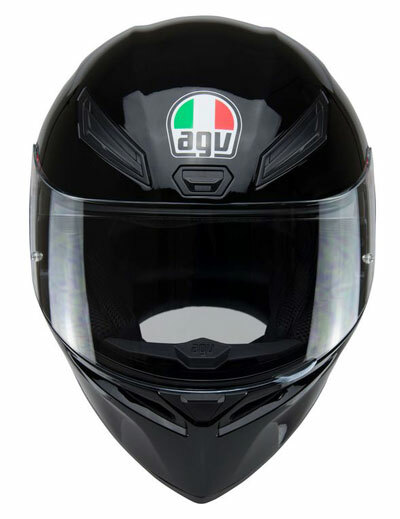 Plus, with its wide & tall visor for use on a sportsbike, decent ventilation system and all the other features you’d expect to see in a modern helmet like quick release visor and removable and washable internal, we reckon the AGV K1 should be a good helmet to live with too. So, if you love the looks of a Rossi helmet (or a McGuinness, Morbidelli, Martin, Hillier – in fact the list of riders who wear a Pista GPR goes on and on) but can’t afford or don’t need a helmet costing towards a grand – and if you’re after a sporty helmet from a maker you know you can trust, then we reckon it’s going to be well worth checking out the new AGV K1. OK, there’s stacks of great alternatives out there if you’re just after a reasonably priced full face helmet – check out our top 10 full face helmets to start yourself off! But if you’re after a helmet that’ll work with your sportsbike, then here’s a few more to take a look at (and of course flip over to our top 10 sportsbike/track helmets page). Most other sporty helmets are a bit more than the K1, mainly because they use more exotic or complex construction techniques and also because with most other makers, their sportsbike helmets are the actual helmets used on the track in pro-racing! The LS2 FF323 Arrow comes in either fibreglass or carbon versions and can be had for under £200 which is pretty amazing when you consider you’re getting a real MotoGP developed SHARP 4 star safety rated full face track helmet. HJCs FG-17 is a sportsbike/track helmet that can be had for around the same money as the K1 and that’s SHARP 4 star safety rated too. If you’ve a bit more to spend, even though Bell’s Bell Star is their entry level track helmet, it’s still a composite fibre helmet that scored a maximum 5 stars when SHARP safety tested it. 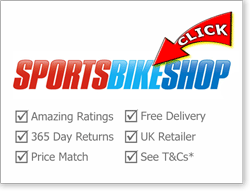 Check out our Sportsbike or track helmets sections for more previews and reviews of helmets suitable for your sportsbike.